Sufficient dimension reduction (SDR) provides a framework for reducing the predictor space dimension in statistical regression problems. We consider SDR in the context of dimension reduction for deterministic functions of several variables such as those arising in computer experiments. In this context, SDR can reveal low-dimensional ridge structure in functions. Two algorithms for SDR—sliced inverse regression (SIR) and sliced average variance estimation (SAVE)—approximate matrices of integrals using a sliced mapping of the response. We interpret this sliced approach as a Riemann sum approximation of the particular integrals arising in each algorithm. We employ the well-known tools from numerical analysis—namely, multivariate numerical integration and orthogonal polynomials—to produce new algorithms that improve upon the Riemann sum-based numerical integration in SIR and SAVE. 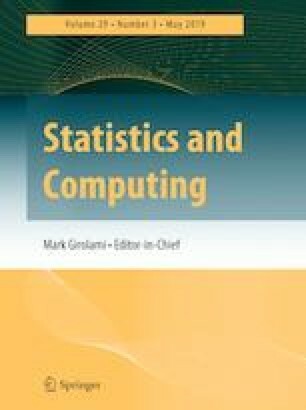 We call the new algorithms Lanczos–Stieltjes inverse regression (LSIR) and Lanczos–Stieltjes average variance estimation (LSAVE) due to their connection with Stieltjes’ method—and Lanczos’ related discretization—for generating a sequence of polynomials that are orthogonal with respect to a given measure. We show that this approach approximates the desired integrals, and we study the behavior of LSIR and LSAVE with two numerical examples. The quadrature-based LSIR and LSAVE eliminate the first-order algebraic convergence rate bottleneck resulting from the Riemann sum approximation, thus enabling high-order numerical approximations of the integrals when appropriate. Moreover, LSIR and LSAVE perform as well as the best-case SIR and SAVE implementations (e.g., adaptive partitioning of the response space) when low-order numerical integration methods (e.g., simple Monte Carlo) are used. Glaws’ work is supported by the Ben L. Fryrear Ph.D. Fellowship in Computational Science at the Colorado School of Mines and the Department of Defense, Defense Advanced Research Projects Agency’s program Enabling Quantification of Uncertainty in Physical Systems. Constantine’s work is supported by the US Department of Energy Office of Science, Office of Advanced Scientific Computing Research, Applied Mathematics program under Award Number DE-SC-0011077.